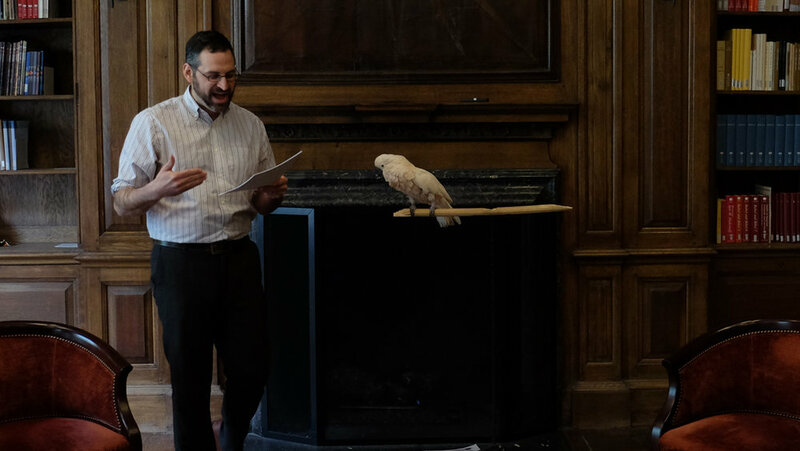 ISAW Assistant Research Scholar Patrick Burns and Pinkie the parrot led a tea time talk on "Parrots in Antiquity." Interim Director and Professor of the History of the Exact Sciences in Antiquity, Alexander Jones, has written a poem for Pinkie. 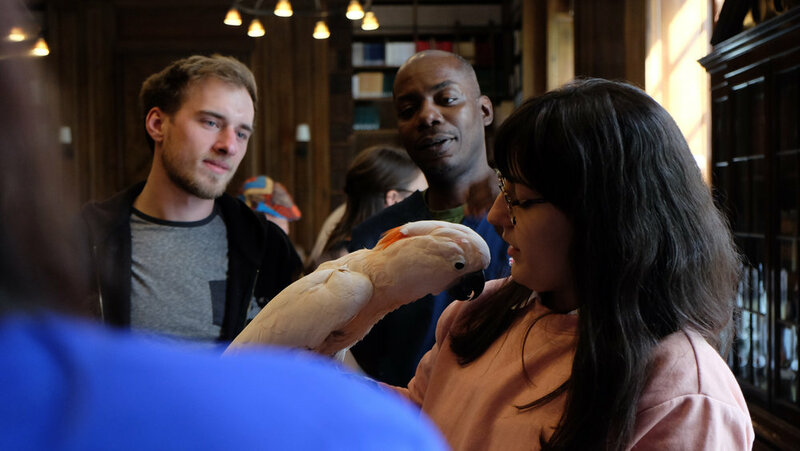 ISAW Assistant Research Scholar Patrick Burns and Pinkie the Parrot Lead Talk on "Parrots in Antiquity." 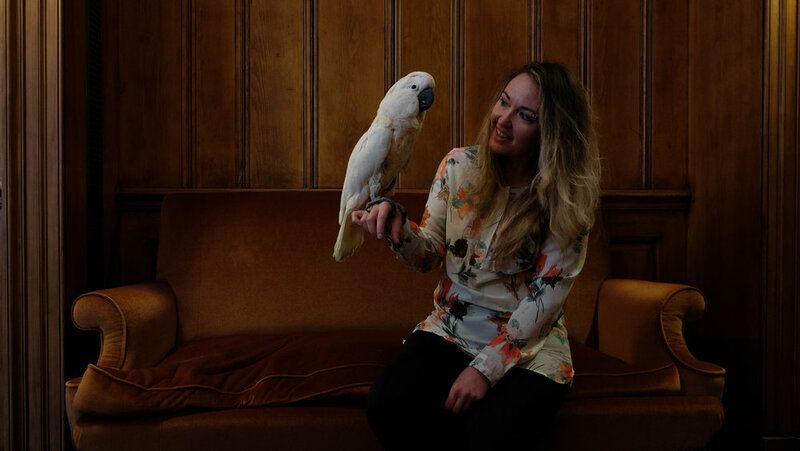 ISAW Assistant Research Scholar Patrick Burns and Pinkie the parrot led a tea time talk on "Animals in Antiquity." Come by to see Pinkie yourself weekdays in May from 2-5pm! 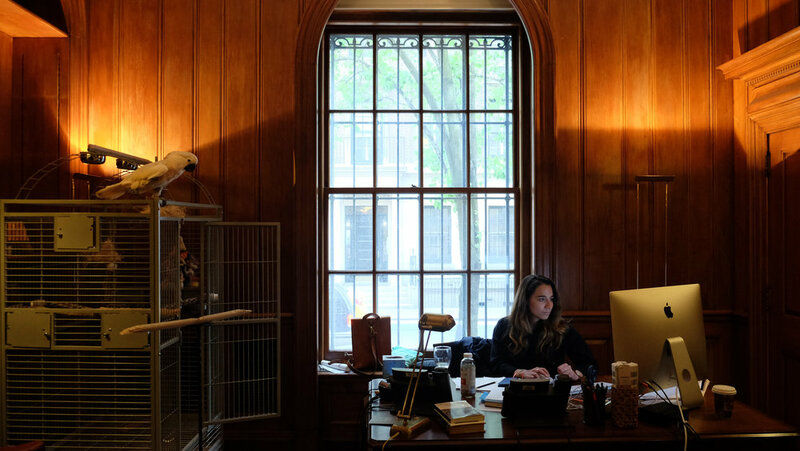 Save the date of Friday, May 19th at noon for our next "Animals in Antiquity" talk. RSVP to mp4071@nyu.edu. ISAW scholar Irene Soto is interviewed by Jus Broadcasting's show the VIBE on aspects of beauty and fashion in the ancient world. French Archaeological Mission to Ras Shamra-Ugarit, photographs of Françoise Ernst-Pradal. What is sometimes called “The Hurrian Hymn” is the earliest known example of music notation, dating to around the 13th century BCE. The hymn is written on a clay tablet (about the size of a smart phone), in cuneiform script. Cuneiform is the earliest known form of writing, which used a stylus (usually of reed) to make fine incisions on wet clay. Cuneiform was a complex writing system, used to write several different languages (as our alphabet is also used to write different languages). This tablet is a good example of this, as it includes the words of the song (lyrics) in the Hurrian language, and the music instructions (or “notation”) in Akkadian. Akkadian is an early Semitic language, belonging to the same family of languages as Arabic and Hebrew. Hurrian, on the other hand, is not related to any contemporary language, and it is poorly understood. The tablet was found at the site of ancient Ugarit (contemporary Ras Shamra), 1km from the Syrian coast. There are several other examples of tablets with music notation from this site, but one well preserved example (although even this tablet is damaged). The tablet was discovered during French excavations of the 1950s, in the archives of the royal palace, together with many other texts of various types, such as letters and administrative documents. It is now in the National Museum of Damascus, Syria. Ugarit was a city known for being a cosmopolitan centre during the late Bronze Age (14th and 13th centuries). This was due to its being a gateway for trade on the Mediterranean coast, as well as the fact that it was constantly being fought over by the great powers to its east (Mittanni, contemporary northern Syria), south (Egypt) and north (Hatti, contemporary Turkey). The cosmopolitan character of Ugarit in this period, is confirmed by the multilingual nature of texts found there, such as the Hurrian Hymn that uses both the Hurrian language for the lyrics, and the Akkadian language for music notation. The upper part of the tablet obverse includes a hymn written in Hurrian. The text of this hymn is difficult to translate. However, the theme is clearly the promotion of fertility. It is addressed to the moon goddess, Nikkal. It refers to the making of offerings and libations (sesame oil) to the deity, and the placing of a ritual object (of lead) at the foot of the divine statue. The lower part of the tablet (below the double line) includes musical instructions, written in Akkadian. The above text is excerpted from a longer dossier that Sam Mirelman, graduate student at the Institute for the Study of the Ancient World, wrote for the project partners. Download Sam Mirelman's complete information sheet on the Hurrian Hymn here. Download sheet music interpretation of the Hymn here.